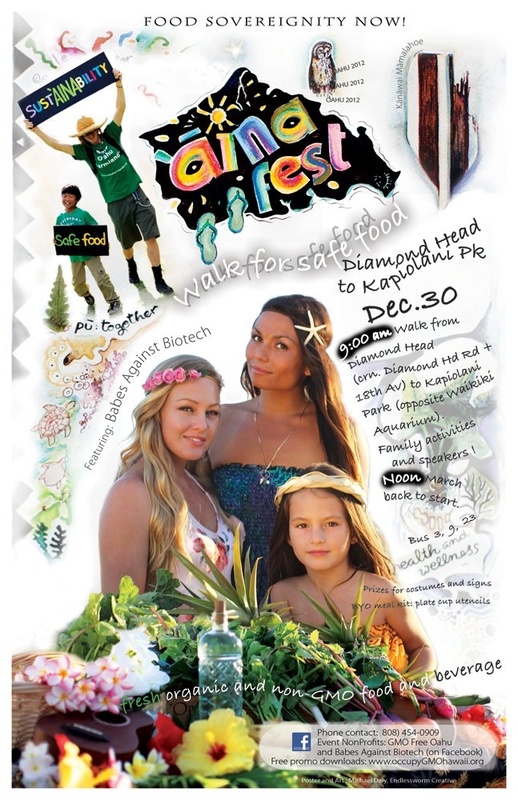 GMO-Free Oahu and Babes Against Biotech present this Sundayʻs (12/30/2012) "ʻAina Fest -- Food Sovereignty Now." 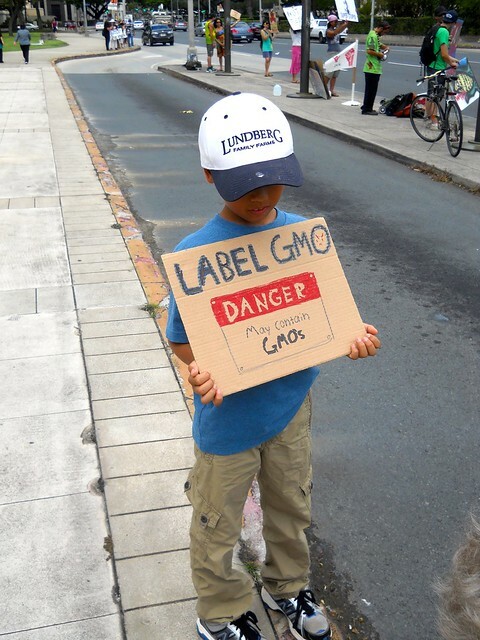 Beginning with a march down Diamond Head Road (across from Kapiolani Community College) and ending at Kapiolani Park (near Kalakaua across from the Aquarium) it hopes to gather together the diverse opponents of GMO to meet each other, talk, and trade stories and ideas. There will be informational booths, childrenʻs activities, and prizes at the park. And organic food, of course. We, members and friends of GMO-Free Oahu and Babes Against Biotech, would like you to join us in spreading awareness by demanding food sovereignty for all. People have the right to decide what they eat and to ensure that food in their community is healthy and accessible for everyone. However, that right has been stripped from us by large corporate interests. The current food system does not support small, local farmers and sustainable agricultural practices. Consumers do not know if they are eating genetically modified food. For two decades, biotech has used prime agricultural lands in Hawai’i for growing genetically modified seed and experimental crops. Their practices is contrary to the heart of Hawaiian value of Malama ʻAina (love and respect of land). 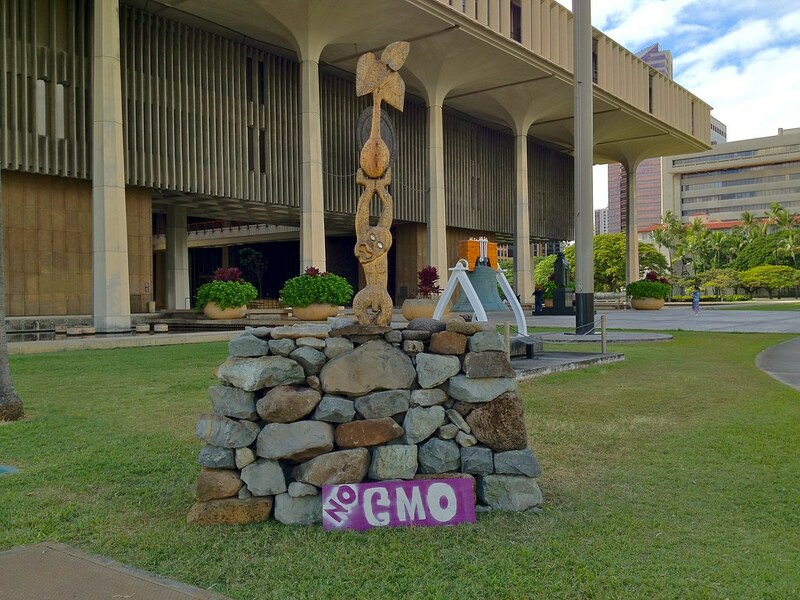 In an effort to get some kind of GMO labeling bill heard, a group of activists from Oahu and the neighbor islands erect the kiʻi of Haloa on the grounds of the State Capitol in downtown Honolulu. The structure and the rallies have no effect on the biotech funded Hawaii legislature during the 2012 session. The stone structure was erected in an afternoon by skilled stone workers from Oahu and the neighbor islands. Click here for more pics. 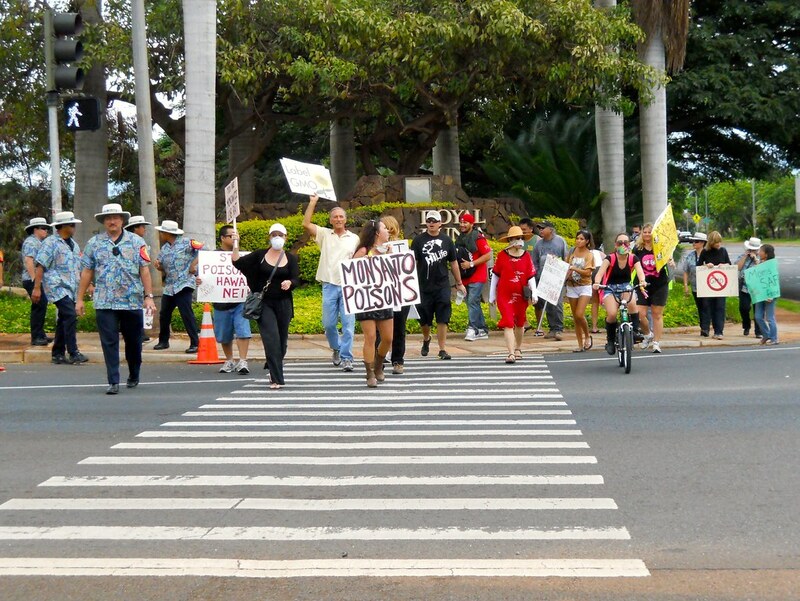 For the first time, people are pissed enough to walk in the midday summer heat and stand in front of Monsantoʻs gate in Kunia on the island of Oahu. Monsantoʻs poison fields are directly across a residential subdivision and down the block from a shopping mall where the demonstration started. Like other GMO corporations, Switzerland based Syngenta finds Hawaiʻi an ideal place for their experiments. 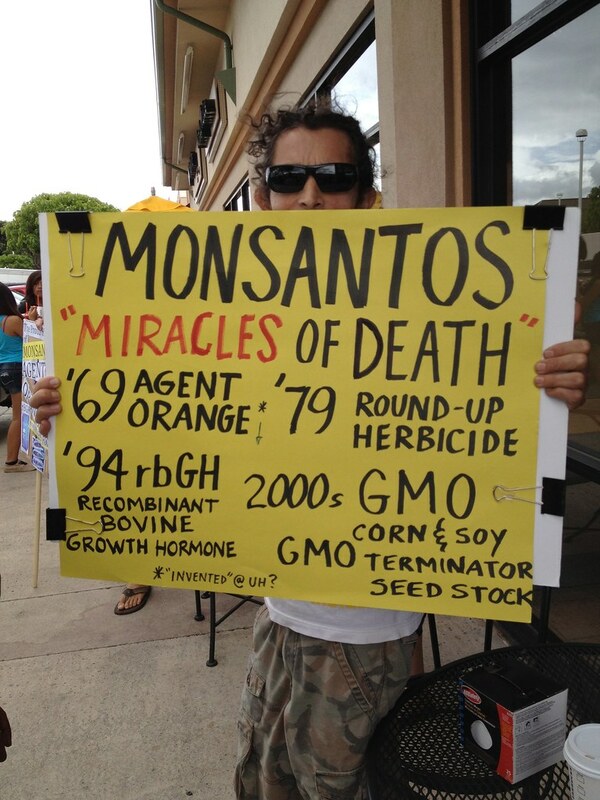 For one thing, itʻs far away from their Switzerland home where growing GMO is banned. 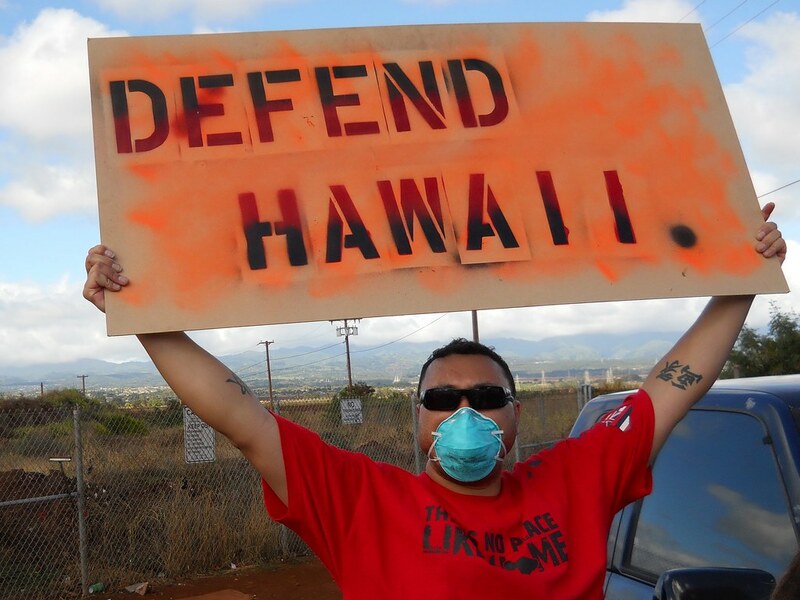 Some take the GMO industryʻs presence in Hawaiʻi as an assault on the ʻaina and the people. Waimanalo Health Center presents GMO lobbyists! A rare gathering of the top GMO execs/lobbyists make a presentation at Waimanalo Health Center. Except they refuse to allow any photography, audio recording, or video. Whoops, I leave my livestream on and catch the slick PR presentation of lies. And the people catch them in the lies. One disturbing thing is that since Oahu is very densely populated, all the GMO sites are very close to residential communities. DuPontʻs Pioneer Hi-Bred is being sued in Kauai for toxic drift onto a neighboring residential area. On Oahu, the are just up the road from Waialua High School. On August 20, 2012, a coalition of protesters take the gate for the afternoon and stand along the roadside so the neighbors can find out what is in their community. 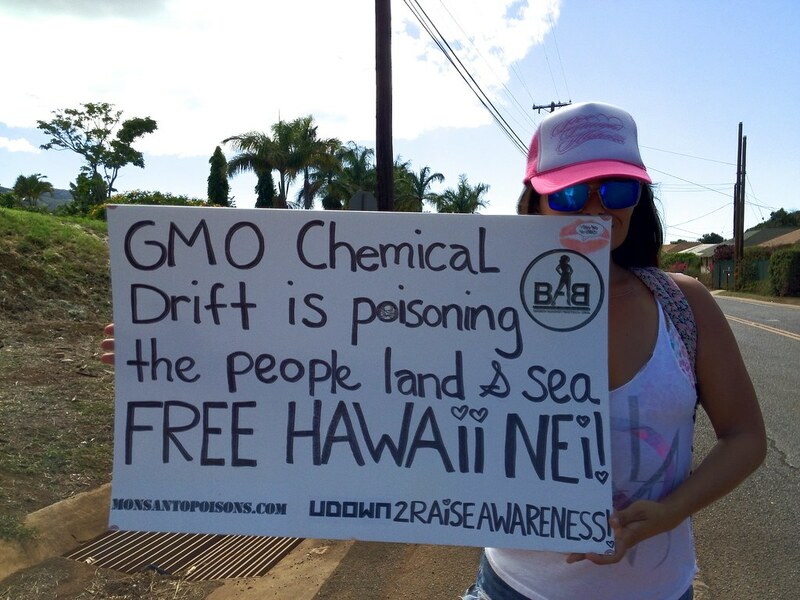 Aubrie Marie of Babes Against Biotech Aubrie at the Waialua demonstration against Dupontʻs Pioneer Hi-Bred. Click here for complete photo story. A nationwide call to protest multinational corporate GMO giant Monsanto is welcomed in Honolulu as protesters call for GMO labeling in front of the State Capitol building. Anti-GMO activist makes a reasonable request. Click here for photo story. My livestream of a great presentation on GMO and biotechnology by Dr. Juanita Mathews of the University of Hawaii didnʻt record video, but her presentation is so rich in info it makes a great audio (downloadable if you want) presentation/podcast here at Soundcloud. Monsantoʻs request to the Hawaii Water Commission to increase their allotment of water meets with public outrage. Hereʻs Mana Ai Daniel Anthonyʻs poignant testimony. Does testimony like this effect the final decision on December 19? I hope so. Monsantoʻs request fails, 3 for, 3 against. At Monsantoʻs gate again as Honolulu City Council ignores neighbor island GMO labeling provisions. All three neighbor island counties pass provisions for the labeling of GMOs in their legislative package. Honoluluʻs City Council, heavily funded by the biotech industry, pulls that provision from the legislative package. The demonstration of November 29, is and attempt to get their attention for the last Council meeting of the year on December 5. Nomi Carmona of Babes Against Biotech leads the group to Monsantoʻs Kunia gate. Note that subdivision Royal Kunia is right across the street from Monsantoʻs herbicide laden fields. Click here for full photo story. Which brings us up to this Sunday, December 30. See you at The ʻAina Fest!